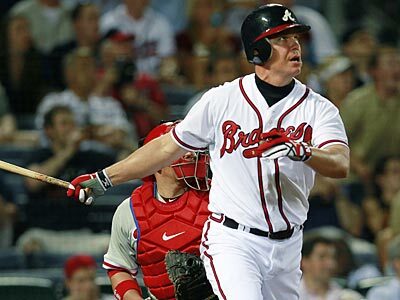 The Phillies and Braves do not have a lot of time to recover from last night’s 11 inning offensive outburst. The two teams combined for 28 runs on 36 hits with the Braves coming out on top with a 15-13 win. The Phillies, who have struggled to score runs of late, exploded offensively but, in a somewhat surprising twist, Roy Halladay could not hold the lead and the bullpen could not hold a subsequent four run lead. The Phillies (12-13) get back at it today in Atlanta (15-10) at 12:10. Joe Blanton gets the call for the Phillies and he will square off against Braves starter Randall Delgado. Blanton (2-3, 3.81 ERA, 1.31 WHIP) threw 7.1 innings last Saturday against the Cubs while allowing just two runs on eight hits while striking out eight in route to a 5-2 Phillies win. Blanton had lost his previous two starts. Both of Blanton’s wins this year he has looked stellar on the mound going 7 and 7.1 innings respectively. Delgado (2-2, 6.30 ERA, 1.75 WHIP) allowed four runs on eight hits while walking three Pirates over 4.1 innings on Saturday. Delgado got the loss and only struck out four as he was roughed up in his second consecutive start. Delgado allowed five runs on three hits over 5.1 innings in his previous start. The Phillies come into today’s game looking to take two out of three in Atlanta and get back to .500. Phillies catcher Carlos Ruiz had a big game last night as he hit his fourth homerun of the year and drove in seven runs. He now leads the team in batting average (.329), home runs (4), and RBI (17). Braves catcher Brian McCann also did some damage last night. He became just the fourth player ever to hit a grand slam off of Halladay and the first player since 2008. Chipper “Larry” Jones continued his assault on the Phillies in his career as he ended the game in the 11th with a two-run home run to centerfield. First pitch is slated for 12:10 pm. The game can be seen on Comcast Sportsnet and heard on 94.1 WIP.